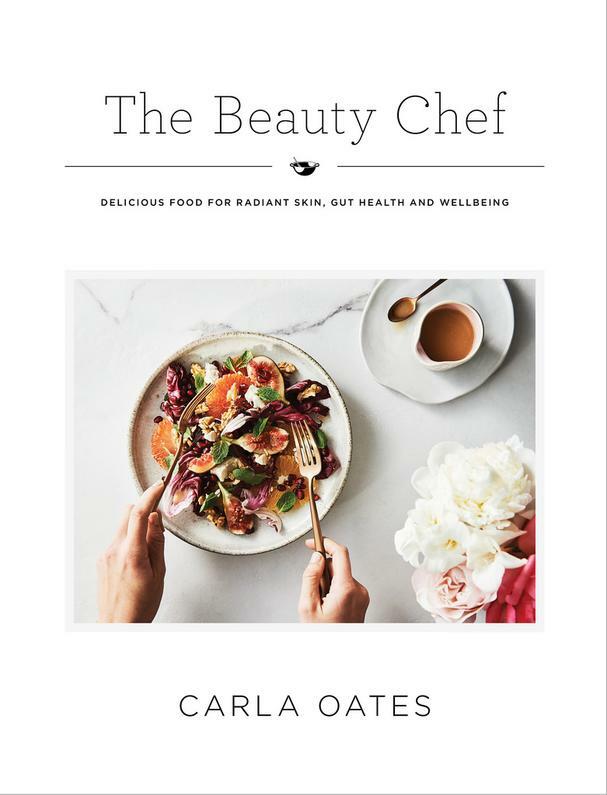 Day 5 in our Gut Health Series brings us another vibrant recipe from Carla Oates' beautiful new cookbook The Beauty Chef: Delicious Food for Radiant Skin, Gut Health and Wellbeing. It contains over 150 delicious and nutritious dishes that are gluten-free and mostly dairy-free that will leave you looking and feeling healthy and wholesome inside and out. The founder and 'chef' behind the popular Australian beauty and wellness brand, The Beauty Chef, believes healthy, radiant skin comes from a well-balanced gut. She delves into the common causes of gut health issues, such as inflammation, grains, dairy, fats, and sugars, and shares her Glowing Kitchen Tips and Beauty Nutrients table which relates the health benefits of various nutrients and where to find them. The recipes in the cookbook feature family-friendly recipes as well as healthy versions of classic dishes, meals for special occasions, and traditional ferments. Chapters cover every meal of the day, including Baking, Drinks, Snacks, Sides, and Basics (fermentation, broths, cultured products, breads, wraps, sauces, and more). These lovely Brussels sprouts and kale fritters are loaded with good-for-you antioxidants and probiotics that will nurture you from within and make you feel luminous! Preheat the oven to 150ºC (300ºF). To prepare the avocado, pea and mint smash, bring a small saucepan of water to the boil. Blanch the peas for 20 seconds. Drain and refresh in a bowl of iced water. Drain. Place the peas and avocado in a medium bowl. Using a potato masher, coarsely mash together. Add the lemon juice and mint and stir to combine. Season with salt and pepper. 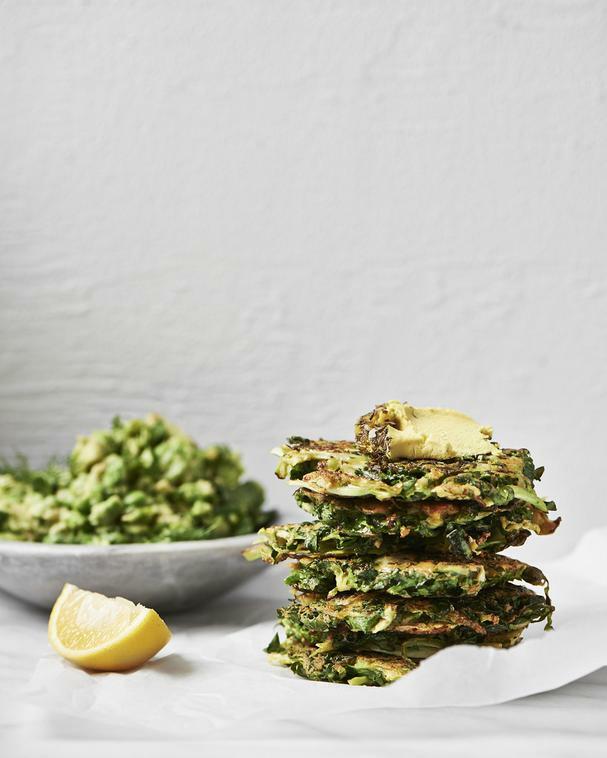 To prepare the fritters, place the Brussels sprouts, kale, spring onion, savoury yeast flakes, mint, dill, garlic, capers, lemon zest, arrowroot, salt and pepper in a medium bowl. Mix well to combine. Add the eggs and stir to coat. Preheat a large non-stick frying pan over medium heat. Drizzle with oil. Cook the fritters in batches, spooning 2–3 heaped tablespoons of mixture into the pan for each and flatten slightly to make 1 cm (1/2 in)-thick fritters. Cook for 2 minutes on each side, or until golden brown. Transfer onto a plate and place in the oven to keep warm while you cook the remaining fritters. To serve, spread cultured nut cheese over the fritters and top with the avocado, pea and mint smash. Serve with lemon wedges. Drain and rinse the cashews. Place the cashews, lukewarm water and probiotic powder in a high-speed blender. Blend until smooth. Transfer to a glass or ceramic bowl. Cover with a piece of muslin (cheesecloth) and secure. Stand at room temperature in a warm place (on top of the fridge is a good spot) for 1–2 days, until thickened with a pleasant sour taste. Add the yeast flakes, lemon juice, onion powder, salt and turmeric, if using, and stir to combine. Spoon the mixture onto a double-layered square of muslin cloth (cheesecloth). Bundle up into a ball, tie and hang off a spoon suspended over a bowl. Stand at room temperature for 4 hours, or until the ‘cheese’ reaches your desired firmness. ‘Cheese’ can be served plain, wrapped in vine leaves or coated in spices. If serving plain, press into a plastic wrap–lined mould or shape and wrap in clean muslin or baking paper. Serve immediately if you prefer a softer, spreadable texture. Alternatively refrigerate for 2 hours or up to 3 days, to firm your cheese up further, until the desired consistency is reached. If wrapping the ‘cheese’ in vine leaves, place a large spoonful of the ‘cheese’ into the centre of a large vine leaf. A softer, spreadable consistency is best for wrapping. Fold the edges in to enclose and form a parcel. Serve immediately or refrigerate until desired. To coat, shape the ‘cheese’ into the desired shape –a log or rectangle works well. Wrap in muslin cloth (cheesecloth) or baking paper and refrigerate for 2 hours, to firm up slightly. Roll in herbs de Provence or your choice of spice mix. Serve immediately or rewrap and refrigerate until required, up to 5 days. NOTE: Store the ‘cheese’ wrapped in plastic wrap or baking paper in the refrigerator for up to 5 days.